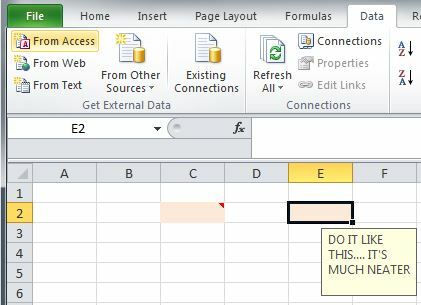 When I wanted to show instructions to users on spreadsheets I used to use Excel cell comments or write something in another cell on the sheet. Comments leave unwanted little red triangles everywhere and instructions dotted around on a sheet may just mess with your fine tuned formatting. Also, Normal Excel comments only appear when you hover your mouse pointer over them. 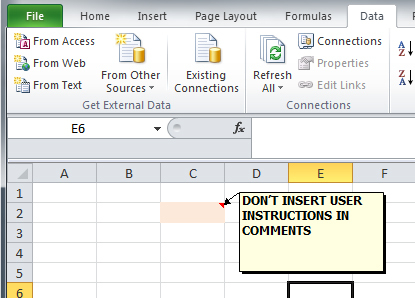 What if you want the comment to appear when a user selects a particular cell. Now when you select that cell, your message will appear and you wont have an ugly little red triangle getting in your face! 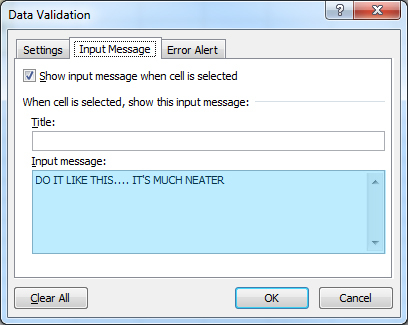 You can obviously combine messaging with other data validation options like drop down boxes etc. Those will be covered in a future post.